VB Migration Partner can recognize and correctly convert a 3rd-party (non-Microsoft) ActiveX control only if a wrapper class exists for it. To create such a wrapper class you use the AxWrapperGen utility. NOTE: you don’t need to run AxWrapperGen if the ActiveX control is written in VB6 and you have its source code. In such case you can just convert the ActiveX Control project with VB Migration Partner as usual and then deploy the resulting DLL as explained in the “Deploying the wrapper class” section below. If the ActiveX control is used only by a few client projects you might also group them in a VB6 project group (*.vbg) and convert all of them in a single operation. AxWrapperGen is a tool that is part of the VB Migration Partner package. (You can find it in the main installation directory, which by default is C:\Program Files\Code Architects\VB Migration Partner.) It is a command-line utility, therefore you must open a command window and run AxWrapperGen from there. You can read the complete AxWrapperGen reference in chapter 4 of our online manual. We also recommend that you read the A smart approach to 3rd-party ActiveX control conversion whitepaper to become familiar with the concept of wrapper classes, ActiveX control migration and ActiveX control replacement. IMPORTANT NOTE: You can run AxWrapperGen only on ActiveX controls for which you own the design-time license. 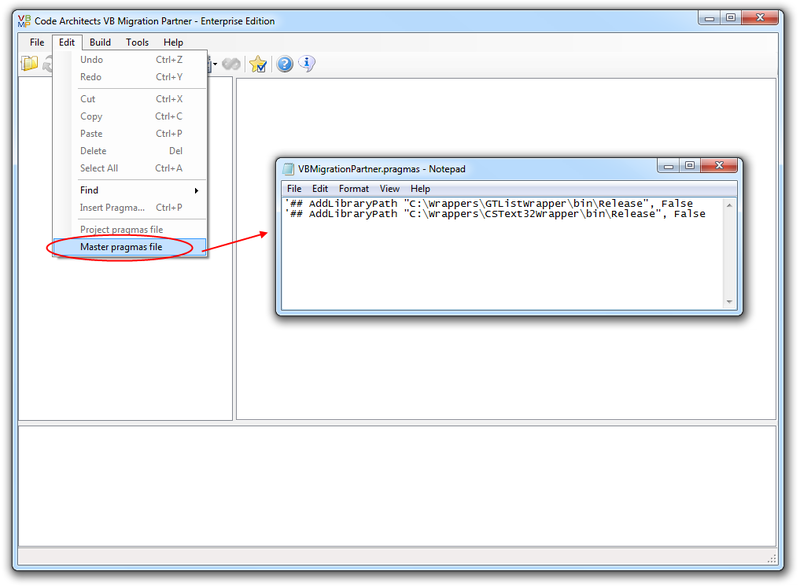 AxWrapperGen runs the AxImp tool – which is part of the .NET Framework SDK – behind the scenes, to generate two DLLs that work as the RCW (Runtime Component Wrapper) for the selected control. For example, the mscal.ocx control generates the following two files: msacal.dll and axmsacal.dll. You can specify the following five options, which AxWrapperGen passes to AxImp: /keyfile, /keycontainer, /publickey, /delaysign, and /source. For more information, read .NET Framework SDK documentation. * The first class of each pair works as a wrapper for the original ActiveX control. * The second class of each pair provides support during the migration process. 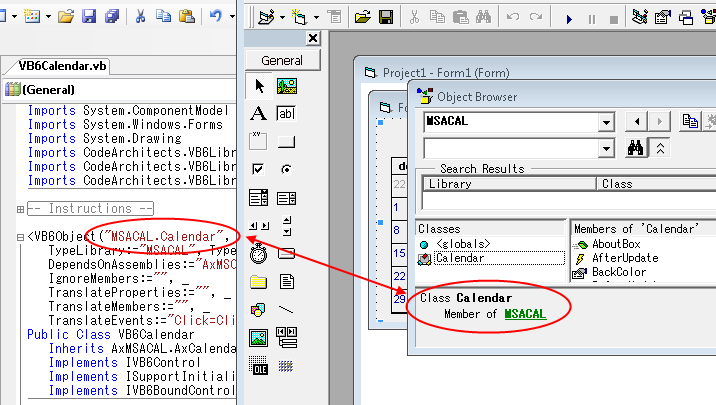 In our example, the MSCAL.OCX file contains only one ActiveX control, therefore only two classes will be created: the class named VB6Calendar inherits from AxMSACAL.AxCalendar and wraps the ActiveX control; the second class is named VB6Calendar_Support and inherits from VB6ControlSupportBase. This *_Support class is instantiated and used by VB Migration Partner during the migration process, but is never used at runtime during execution. NOTE: if the ActiveX control in question uses databinding to display database data using DAO and the “classic” Data control, converting it with AxWrapperGen is pretty useless, because the resulting .NET control won’t find any Data control on the migrated form. Unfortunately, DAO databinding relies on a number of undocumented, proprietary Microsoft interfaces that cannot be implemented under .NET. This is the reason why VB Migration Partner doesn’t (and can’t) support the DBGrid32, DBCombo and DBList ActiveX controls, nor any other control whose main purpose is being bound to a DAO Data control. The same reasoning apply to controls that bind to the RDC Data control. 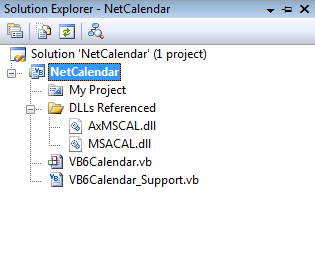 In most cases AxWrapperGen generates a wrapper class – or a set of wrapper classes - that compiles with no errors to a .NET DLL (NetCalendar.dll in our example). This DLL depends on at least the two DLLs that were generated by AxImp (AxMSCAL.dll and MSACAL.dll in our example), plus other files that AxImp may generate. You should consider all these DLLs as a single deployment unit and to always move all of them together when advised to do so. If the AxWrapperGen-generated project compiles correctly, the next step is to deploy the set of DLLs to a folder where VB Migration Partner can find it. If you later fix and recompile the wrapper class project you have to manually copy again the wrapper class to VB Migration Partner’s folder. It’s easy to skip this important step, in which case VB Migration Partner continues to use the previous (presumably bugged) DLL version without showing any error message. As noted above, you must remember to also copy all dependency DLLs. At times this set of DLLs includes one or more files that are already present in VB Migration Partner’s folder, either because they were installed with VB Migration Partner itself – for example, the ADODB.dll – or because they were deployed there when migrating another ActiveX control. If you overwrite these DLLs many strange and unexpected behaviors may result. Remember that the pragma file must be stored in the same folder as the VB6 project you are converting to .NET. In some cases the wrapper class doesn’t compile correctly and you have to manually fix these problems before continuing. Even if the wrapper class compiles correctly, however, it is a good idea to revising and polishing it before proceeding. NOTE: all the common actions that need to be performed on a wrapper class are summarized in the “Instructions” remark regions at the top of the wrapper class. This section expands on the recommendations described in that section. If these strings don’t match exactly, VB Migration Partner fails to replace the original ActiveX control with this wrapper class during the migration step. After receiving and solving tons of support queries from our customers, we concluded that name mismatch is by far the most common cause of malfunctioning. To support this feature also for the ActiveX control wrapped by the class you must assign the AlternateName property of the VB6Object property. This property doesn’t appear in the AxWrapperGen-generated source code and must be added manually. Not all the properties of the original ActiveX control can or should be migrated to .NET. For example, properties related to docking (e.g. Align), transparent background, and color palettes don’t work under .NET; they can (and should) be ignored when an instance of the control is converted from a VB6 form to a .NET form. When VB Migration Partner converts a form and all the controls it hosts from VB6 to .NET, it reads the design-time value for all the control’s property from the .frm file, more precisely from the topmost portion of this file (that doesn’t appear when you edit the form from inside the VB6 code editor). The vast majority of properties appear in the .frm file with the same name you can use to read or assign the property from code, but in some cases the two names differ. If the properties differ you must instruct VB Migration Partner about the correspondence between the name in the .frm file and the name in the object’s public interface. This information is conveyed in the TranslateProperties property of the VB6Object attribute, as a comma-delimited series of frmname=codename pairs. If you notice that one or more properties of the ActiveX control aren’t converted correctly by VB Migration Partner when it migrates a form, then you should open the .frm file with Notepad and check whether the properties in question have a name different from the name you see in the object browser. Let’s suppose that you realize that VB Migration Partner fails to correctly convert the design-time value of two properties – named HotTrack and Rows – of the fictitious XGrid control. In the VB6 form these properties are assign the values True and 12, respectively, but these values are lost in the migration. NOTE: these code elements aren’t generated if the ActiveX control exposes its own DataXxxx members. If you know for sure that the control does not support data-binding – or if you know that you never use data-binding features in your client forms – then it is a good idea to remove both the Implements statement and the code region. If the original control doesn’t support “classic” drag-and-drop – or if it does, but your client application doesn’t use this feature – then you should remove both the Implements statement and the code region. Another reason for renaming an event is if its name matches a VB.NET keyword. Regardless of the reason, you must rename the event, else the wrapper class can’t compile. The naming convention that we recommend – and that we have used in our VBLibrary – is to append a “6” suffix to the original name to avoid the name collision. If the ActiveX control exposes a property with optional parameters, then the wrapper class will expose two or more overloads of that property. If you later use the wrapper class to convert forms containing the ActiveX control, the .NET form can’t be edited inside Visual Studio. The solution is to remove the overloads by manually merging them back to a property with optional parameters. The wrapper class compiles correctly and you can use it to migrate VB6 forms that contain the VSFlexGrid control; the generated form runs and behaves correctly and everything seems to be working fine. 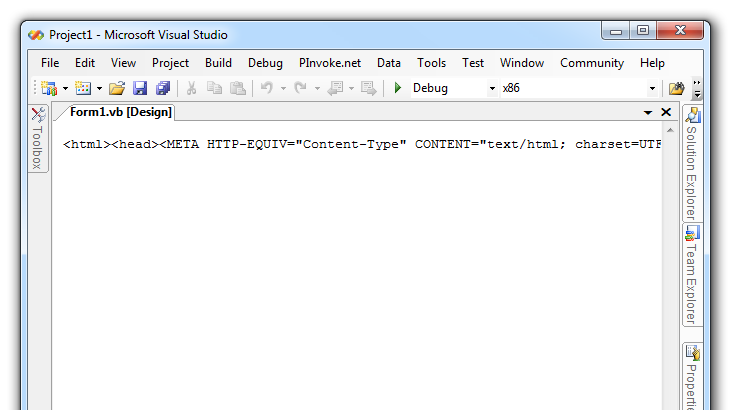 However, if you later try to modify the .NET form inside Visual Studio you see an error message. As you know, AxWrapperGen runs AxImp.exe behind the scenes. AxImp.exe may change the name of a member if the AxHost base class exposes a member with same name. For example, a property named EditMode might be converted into CtlEditMode, and Text might be converted into CtlText. The problem with position- and size-related members such as these is that – in most cases – the ActiveX controls expects values expressed in pixels, whereas the client application uses values that are expressed in the current ScaleMode setting. By default, these values are in twips, but the client app might have set a different ScaleMode, including user-defined modes. You understand that a property requires to be scaled from pixels to a different measure unit if you see that the control stretches or shrinks abnormally after the migration. For example, if a grid column is about 15x larger than it should, then the problem is likely to be a missed conversion from twips to pixels. Here’s how the RowHeight and SetTitleBar members look like after the fixes. By default, all the public properties defined in the wrapper class appear in Visual Studio’s Property window and are stored in the form’s code-behind section (i.e. the *.Designer.vb file that Visual Studio creates for each form). You need to take a few additional steps if you want to hide a property in the property browser and/or prevent that its value be saved in the code-behind section (transient property). NOTE: good candidates for the Browsable attribute are all readonly properties, unless they return an object or a collection.
' TODO: .NET properties cannot have ByRef parameters. Manually fix this code as necessary. You can quickly find all such comments in Visual Studio’s Task List window. Basically, there are two ways to fix this problem. First, you should read the ActiveX documentation and check that – even if passed by-reference – the control never modifies the argument being passed. If this is the case you can safely modify the ByRef keyword into ByVal. In this latter case, be prepared to modify the code in the client form to account for these two new methods. You might experience the following problem: the ActiveX control is migrated correctly and appears to work as expected, except its size is different from the original or its size isn’t preserved when the .NET form is modified inside Visual Studio’s form designer. This section summarizes the most common causes for malfunctioning. Most of them have been already described in depth elsewhere in this document. In some cases an ActiveX control simply can’t be translated to .NET and the blame isn’t on AxWrapperGen. When you find out that anything isn’t working as described in this document, the first thing to do is attempting to add a reference to the ActiveX control from Visual Studio and – if successful – drop an instance of the control onto a .NET form. More in general, whenever you see that the AxWrapperGen-generated wrapper class doesn’t work as expected, your first attempt should be trying to use the same feature on an ActiveX control that you manually dropped on a .NET form inside Visual Studio. If you get the same or similar error, then the problem is likely to be in Microsoft COM Interop technology. If the names match, then the next likely cause for this problem is that you failed to correctly deploy it in a place where VB Migration Partner can find it. For more details, double-check the “Deploying the wrapper class” section. Another possible cause for this problem is that your application consists of multiple project and they use different versions of the ActiveX control. Read this KB article for more information. The path of the ActiveX control specified in the project .vbp file isn’t correct. To ensure that the contents of the VBP file is up-to-date, please load the project in the VB6 IDE and then save it again. This problem usually occurs if you deployed the wrapper class DLLs to VB Migration Partner’s setup folder. Please notice that we recommend that you instead deploy the DLLs to a folder pointed to by an AddLibraryPath pragma, as explained in the “Deploying the wrapper class” section. ActiveX controls store their properties in the code-behind section of a form – that is, the *.Designer.vb file – like standard .NET controls, except they use to pack all property values in a special binary property named OcxState. During the conversion process, VB Migration Partner generates the value for the OcxState property, so that the control can restore all its properties when it is instantiated on a .NET form. In some (rare) cases, VB Migration Partner fails to generate a correct value for the OcxState property, often because the specific control uses a nonstandard mechanism to store its properties. If you realize that the control’s design-time properties aren’t initialized correctly or if the form fails to run correctly, you should attempt to use Microsoft Upgrade Wizard (included in Visual Studio 2005 and 2008) to migrate that form and generate a valid OcxState, which you can later reuse with VB Migration Partner by means of the ReuseResxFiles pragma. For more information, please read this KB article: [PRB] ActiveX controls aren’t migrated correctly. The control exposes properties or methods that take values that are affected by the parent form’s ScaleMode. In this case you should fix the wrapper class as described in paragraph 10 of previous section. If the control’s size appear different at design-time – usually much larger than it should – then you should edit the support class, as described in paragraph 13 of previous section. You are likely to run the client as a 64-bit application. Read this KB article for more information. Read paragraph 2 in “Fixing and polishing the wrapper class” section. Once your wrapper class works well, you can use VB Migration Partner to convert all the VB6 projects that use that ActiveX control. However, keep in mind that the resulting .NET project will still depend on COM and ActiveX legacy technologies, which is usually undesirable in the long run. To get rid of this dependency you must edit the wrapper class so that it inherits from a “pure” .NET control rather than the ActiveX control. This section describes all the steps you must take to do the replacement. The first thing to do is deciding which .NET control you want to use to replace the legacy ActiveX control. In general, you should select a .NET control that has all the features that you need (among those exposed by the ActiveX control) and, preferably, a control that exposes an object model that is similar to the programming interface of the ActiveX control. If the vendor of the original ActiveX control is still in business and if it released a .NET version of the original control, then the decision is obvious. This is the case, for example, of the majority of the controls that were sold by companies such as Sheridan (which changed its name into Infragistics), or Apex and VideoSoft (which joined in the company named ComponentOne). Many VB6 developers used 3rd-party ActiveX controls only because the corresponding VB6 built-in control wasn’t powerful enough. This is the case, for example, of the many “super textbox” controls offered by companies such as Crescent and MicroHelp. Most of these ActiveX controls can be conveniently replaced by the controls that are included in the System.Windows.Forms namespace, in which case you don’t have to purchase any additional control. Also notice that you should delete the DependsOnAssemblies property of the VB6Object attribute, to inform VB Migration Partner that this class doesn’t depend on the ActiveX DLLs any longer. As soon as you change the Inherits class, many compilation errors will appear in the wrapper class when the MyBase keyword is used, because the new .NET control has programming interface that differs from the ActiveX control. The Name, Index, Parent, and Container properties are part of the IVB6Control interface, which must be exposed by all controls that are converted by VB Migration Partner. The code that AxWrapperGen emits for these properties is correct, thus you don’t need to remark them out. The Left, Top, Width, and Height properties are always error-free and are mandatory, therefore you don’t need to remark them. The ZOrder, Move, and Focus methods are always common to all controls and don’t need to be commented. The list of members that you can safely leave uncommented includes ToolTipText, MousePointer, MouseIcon, Object, and all FontXxxx properties. NOTE: as modified in this example, the support class does nothing and might be completely removed from the DLL that contains the wrapper class. Don’t do that now, however, because you might later find out that some nonstandard actions must be necessary during the migration process. An ActiveX control – especially complex controls such as grids and charting controls – expose literally hundreds of properties, methods, and events. In general you don’t want the wrapper class implement all of them, because it would be a huge waste of time in most cases. The members that you really want to implement are only those that your VB6 client projects actually use. You compile the wrapper class (with most members still remarked out – see previous point), use VB Migration Partner to migrate the VB6 project(s) and take note of all compilation errors caused by the members that the wrapper class should expose but doesn’t. You use a code analysis tool to analyze the VB6 code and automatically create this list for you. One of the best VB6 code analysis tool we know is VBDepend, so you can download a demo version and check how well it can create this list for you. Now that you know which properties and methods the wrapper class must implement, you can start uncommenting them, one at a time, while fixing the statement that delegates the call to the inner base class. In completing this task you can face many different situations, which are described in following numbered paragraphs. In this very favorable case, you can just delete the entire property or method, because it will be correctly inherited from the base .NET control. In most cases, the .NET control implements the same functionality of the original control by means of a property or method that has a different name and/or syntax, but that behaves exactly like in the original ActiveX control. As you see, this code intercepts the Click event coming from the inner .NET control and forwards it to all control’s clients that have registered this event. This latter forwarding action must be performed by means of the VB6EventDispatcher.Raise method, else the control might fire events at the wrong time (for example, while the form is being loaded). In most cases, these code sections can be uncommented and they will work correctly. In other cases you might need to edit the code to account for event arguments (which aren’t needed in this specific case). The cases discussed in paragraphs 6, 7, and 8 above account for the vast majority of members, but not for all of them. In remaining cases you must perform the “mapping” between the outer member (that has the original ActiveX name and syntax) and the inner member (as exposed by the .NET base control). There are so many cases that it is virtually impossible to describe how to handle each of them. However, the key point is that the wrapper class mechanism is powerful enough to allow you to account for things such as different member names, syntax, and behavior. For example, you can alter the order in which events fire or can even prevent an event from firing. You can now compile the “.NET-only” wrapper class to a DLL and deploy the DLL as you did with the old DLL, as described in the “Deploying the wrapper class” section. In most cases all migrated projects will work exactly as before. In some cases, however, it might be necessary that you manually adjust projects references, to ensure that they point to the new DLL. In some rare circumstances you might also need to convert again the client project(s). This is necessary, for example, if you modified the TranslateProperties, IgnoreMembers, or TranslateMembers properties of the VB6Object attribute. The wrapper class approach to ActiveX control conversion and replacement is powerful enough to allow you to face even the most intricate situations. Writing a bullet-proof wrapper class is simple, because most of the job is performed by the AxWrapperGen utility, yet you must be prepared to handle some special cases yourself. This document – especially its Troubleshooting section - should be your first reference when something doesn’t work as expected. If you meet an issue that isn’t covered by this article, please send us a note: we will help you in migrating your specific control and will extend this document so that other VB Migration Partner users can find a solution to similar problems.